Jeffrey P. Kharoufeh was introduced Friday as the new chair of the department of industrial engineering. He expects to start in mid-July and will come to Clemson from the University of Pittsburgh, where he is a professor and co-director of the Stochastic Modeling, Analysis and Control Laboratory. 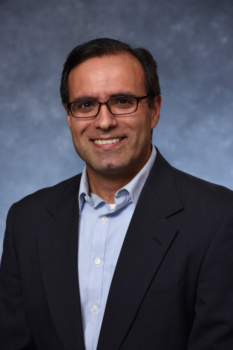 Kharoufeh said that his goal is to make the industrial engineering department among the nation’s top 10 without sacrificing the personal touch enjoyed by its faculty, staff and students. “They can expect me to be very personable, they can expect me to be involved and they can expect me to lead,” he said. Kharoufeh said growth in the department and university is what initially attracted him to Clemson. He also liked the strategic plans set forth by the university and the College of Engineering, Computing and Applied Sciences.